FOOD ADDICTION – Is it really possible to be a chocoholic? Are you a “carb craver” or “chocoholic”? We often use language associated with addiction to describe our relationships with food. But is it really possible to be addicted to certain types of food? The idea of “food addiction” remains controversial and is not yet recognised as a disorder that can be diagnosed in clinical settings. But a growing body of scientific research suggests food addiction may exist. We recently surveyed young Australian adults and found that approximately 15% displayed addictive-like eating tendencies. Certain foods and eating patterns can prompt behaviours and brain responses similar to those seen in more traditional forms of addiction such as drugs and alcohol. These addictive-like eating behaviours could be contributing to overeating and subsequent obesity in vulnerable individuals. So it could be an important piece of the obesity puzzle. Food addiction is commonly characterised using the 2009 Yale Food Addiction Scale. This applies the criteria for substance addiction, such as tolerance and withdrawal, to eating behaviours. This interpretation of food addiction shares many similarities with the criteria we use to diagnose binge eating disorder such as loss of control and intense craving for specific foods. So how can food addiction be set apart from other types of overeating? Studies have shown that while there is some overlap (around 50%) between individuals who display addictive-like eating behaviours and those who meet the diagnostic criteria for binge eating disorder, these can also occur independently. 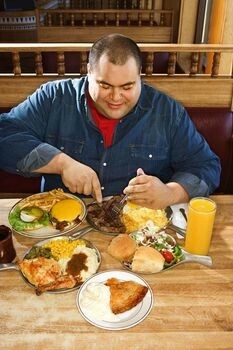 A more recent suggestion is that overeating should be viewed across a continuum ranging from non-problematic occasional overeating to the most severe and compulsive forms, which can be harmful to the person’s health and social life. Much like drinking alcohol can be viewed along a spectrum, with the most severe drinkers labelled as alcoholics, food addiction may be better understood in the same way, representing these more severe subtypes of overeating. Human studies aimed at identifying foods associated with addictive-like eating are rapidly emerging. The types of foods we typically self-identify as potentially addictive are processed “junk” foods high in fat, sugar and salt. In animal studies, rats that are fed a healthy diet do not show the same addictive-like changes in the brain as rats fed highly palatable foods. This suggests that certain properties or ingredients may make specific foods more capable of triggering an addictive-like response. The ingredients added to palatable foods may have properties that can change a number of physiological factors such as hormones that regulate our appetite and neurotransmitters in the brain, particularly the “feel-good” chemical dopamine. The effects of highly processed foods mirror those of other addictive substances. More refined and rapidly absorbed substances increase the rewarding and addictive potential of the substance. This is also not surprising from anevolutionary point of view, as the potency of these rewarding ingredients is far greater in processed foods than in naturally occurring foods. A recent Australian survey found that people displaying addictive-like eating tendencies had significantly higher intakes of high-kilojoule, packaged foods. A study from the United States also demonstrated that the addition of rewarding ingredients such as fats and sugar, as well as the level of processing, increases the addictive properties of a food. However, when we try to think about what actually triggers an addictive eating episode, it is difficult to separate food from the actual act of eating. It is therefore likely that both the specific rewarding characteristics of the food as well as problematic eating behaviours play a role in addictive-like eating episodes. Unfortunately, with the increasing abundance of convenience foods in today’s food environment, heavily manufactured foods are easily accessible and heavily marketed. This could be especially problematic for those vulnerable to addictive-like eating, such as children. In coming years, rigorous research is needed to better understand what food addiction means, and how it can be identified and potentially treated. Such a strategy could inform the development of better weight-loss treatments that target addictive-like foods or behaviours in certain individuals. In addition, understanding the underlying mechanisms for these addictive-like behaviours could identify new drug targets to treat obesity in some individuals. This type of research may also inform better public health policy and environmental changes to help people make more informed decisions about their food and reduce triggers of addictive-like eating in vulnerable individuals. If you relate to these types of behaviours or have any concerns about your eating habits, talk to your local GP or anaccredited practising dietitian. Tracy Burrows is a senior lecturer, Nutrition and Dietetics at University of Newcastle. Kirrilly Pursey is a PhD candidate, Nutrition and Dietetics at University of Newcastle.